In the center of Stowe village with a river view. We are close to everything. 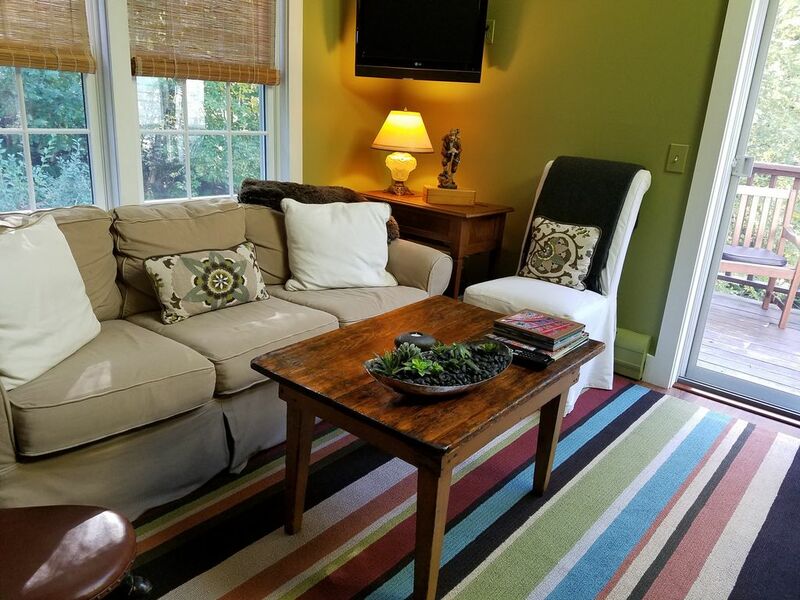 3-bedroom, 2.5-bath, tastefully furnished townhouse with 2 decks overlooking Little River and the forest beyond while still being close to restaurants, and shops. Gas fireplace, Jacuzz tub, dishwasher, washer/dryer, speedy wireless Internet service. We have sharp knives, a pantry full of spices, abundant cookware, a cook's delight. Guests are invited to store skis, snowboards, or bikes in our garage. Don & Joanna Huffman We love Vermont! Close to village and yet you feel secluded with view of Little River and forest. Close to shuttle to the mountain (2 blocks ) Steps away from Mac's grocery. Fly fishing just steps from the house. Many amenities in the house not usual in rental. We are in the village about a block and a half from the intersection of Route 100 and Mountain Road. Restaurants and shops within easy walking distance. Wooded ridge at rear of house. There are also mountain biking and snow shoe trails in that wooded area accessible off Mountain Road parking area. Base-board water heat. Separate controls on each floor. Fully stocked kitchen with all the cookware and amenities including a stocked spice pantry. Keurig single-cup coffee maker with assorted coffees supplied. The Huffman’s home was just what we needed for a great ski week. A very relaxing place with a great view after a long day on the mountain. All the amenities of home. 2nd visit even better than the first! We love everything about this rental. It is comfortable, dog friendly, and great location. This was our second time to stay and first for winter. The property was easy access for the shuttle to ski and Mac's market is such a place for convenience. Great, responsive owners as well! Very clean and comfortable . Owners got right back to me when I had questions . Excellend location! Very nice ! We would stay there again! Nice unit - exactly as described. We enjoyed being in the village of Stowe. Throughout our stay, the owners were very responsive when we reached out with questions. I would highly recommend this place to others! The property was perfect. Well maintained, stocked and very clean. Any questions we did have the owners were extremely prompt in responding. We would recommend this property and stay there again!! Location was perfect, house was clean, comfortable, and so peaceful! Perfect vacation spot! We absolutely loved our stay in Stowe at this great home! It's a perfect layout, quiet, and it was so well stocked! We have stayed at many other VRBO's not nearly as thoughtful with how well stocked things were and organized. We cooked in one night and it was easy to find cooking supplies, seasonings, etc. The location is perfect with a market in the same parking area and several fantastic restaurants within blocks. The owners are accessible and so eager to help which made for a perfect stay! We hope to be back again soon!